Persistent luminescence, commonly also called afterglow, is a special kind of luminescence that is known for it’s ability to emit light for a long period in the dark. It is very useful in different kind of applications like exit signs and watches that need to be seen in the dark and also just for fun such as glow-in-the-dark toys. Nowadays they are also being studied for applications in medical imaging and diagnostics as well as sensing. 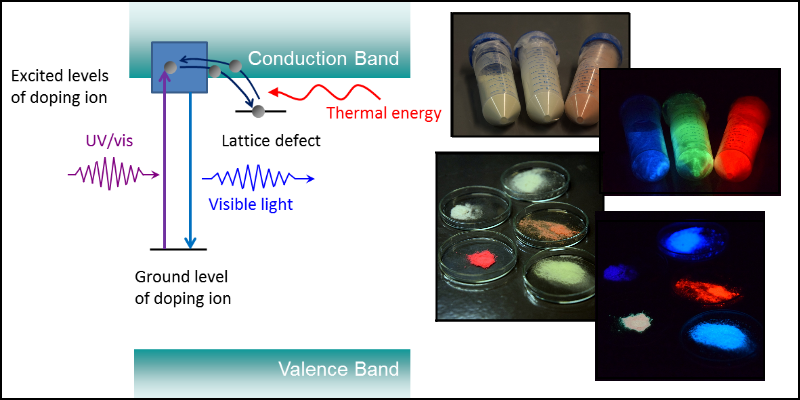 Our group aims to elucidate the mechanism behind this phenomenon in different materials as well as to develop more efficient materials with performance targeted for specific applications.